Infinite CBD is a Colorado-based company that produces a zero-THC CBD isolate product line. While self-claims, especially in the cannabis industry, are to be taken with a pinch of salt, it’s worth noting that Infinite CBD claims to produce products that are specifically designed to help with stress relief and anxiety and fight fatigue, along with an array of other beneficial effects of the hemp plant. The company provides various products that contain an isolate form of cannabidiol, meaning that there is less than 1% of THC present, and thus their products are exceptionally strong in CBD – over 99% concentration. They claim to provide the highest quality all-natural ingredients to ensure the healthiest, cleanest, purest form of CBD oil that is available on the market. This multi-beneficial product line is available in many different forms: drops, soap, cream, capsules, gummies, massage oil, vape juice — even drinkable shots. Let’s explore the brand, the company ethos, and what they’re all about in this complete Infinite CBD review. Infinite CBD Review – Who Are They? 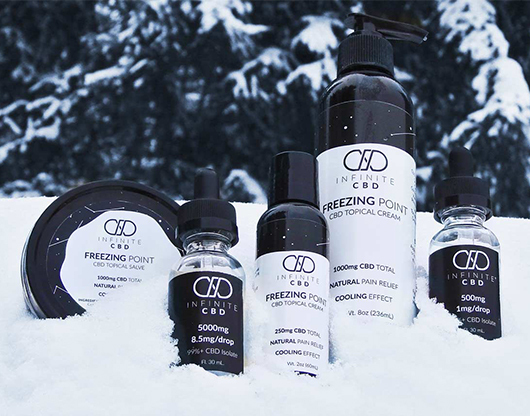 Infinite CBD has been around for about two years, after being established by the owner Stephen Ryan back in 2016. His business kicked off when his son’s best friend’s dad was at a dead end. Suffering from Lyme disease and carrying a Commercial Driver’s License, he didn’t like the effects of opioids and couldn’t consume cannabis. Stephen managed to locate some CBD, and the next day he received a text saying that “this is the most pain-free I’ve felt in years.” At that moment, Stephen knew he was on to something. Our Infinite CBD review disclosed the fact that the company is a single-source entity based in Lakewood, Colorado. They provide 99% and above CBD products to both online customers and wholesalers. The vision of the brand is to provide all industries with the knowledge and education of CBD, while also providing high-quality products. These include the fitness, massage, chiropractor, doctor, and mental health industries. One of the unique aspects of Infinite CBD is the fact that they believe in and are fully committed to isolate products. While the majority of the cannabis industry today claim that full spectrum products are better, Infinite CBD state that although they do believe in the entourage effect and the whole plant working together, they are firm believers in CBD isolate. They go on to say that study after study have specifically found that CBD alone works better than when used together with THC. Lab test results: Each product has a lab results tab under the product description. You know exactly what’s in the product, where it comes from, and peace of mind knowing that it’s been tested by a third-party. Free shipping on orders over $99: If you’re a frequent customer, then the free shipping will be a real bonus. In the long-term, saving money on shipping can really make a difference. The Infinite CBD ‘global impact’: On the website, you will find an “Impact” tab, and this will give you information on what impact the company is having across the globe. There are plenty of success stories from happy customers that have experienced relief from anxiety, depression, pain, and inflammation, among other ailments. No harmful chemicals: You will find no harmful chemicals, pesticides, or herbicides if you decide to buy Infinite CBD oil. They claim to use the purest and cleanest hemp derived isolate – testing above 99% pure CBD. Great selection of products: There is a wide variety of products available, most in a selection of different sizes and potencies. For instance, the Infinite CBD isolate dropper is available in 250mg, 500mg, 1,000mg, 2,500mg, and 5,000mg. One of the downsides of our Infinite CBD review was that we discovered the company doesn’t have a huge nationwide following. Being a relatively small Colorado-based company they’ve likely found plenty of business to sustain them somewhat locally, but still, it would be nice to know that they have a more nationwide customer base. Also, while their CBD oil isolate products are fantastic, it would also be nice if they placed a bit more emphasis on developing a reliable full-spectrum line of products, for those who may want to compare and see which one works best for them. When I went online to buy Infinite CBD capsules, I was legitimately impressed before I even made my product selections, and I was even more thoroughly impressed with the results. These hemp extracted capsules gave me a pure dose of anti-inflammatory and anxiety-relieving effects, with no psychoactive properties. In other words, they were perfect to take in the morning before work and even at the gym before a workout. The capsules are available in 10mg, 25mg, and 100mg strength doses, and in quantities of either 10 or 30 capsules per jar. These are great because you can decide how much you want and test the waters little by little – this especially good if you are new to CBD or want to take small doses at a time. I prefer the 25mg options for my personal CBD regime, but the dosage you consume is up to you, your preferences, and the capacity of your body to process the supplement. I loved that I could use Infinite CBD capsules before a good workout – you don’t lose stamina or energy, but rather you will feel more focused and clear-headed. All in all, my personal conclusion of this Infinite CBD review is that their products are well-made, effective, and pretty fairly priced compared to some of the other top name brands on the market. Infinite CBD Isolate Droppers | The droppers are great for adding CBD to your coffee, smoothie, cooking pan, or to just take orally. One drop contains just 5mg, 1, 2, 3, 4, or 8.5mg of CBD isolate. The mixture ratio of CBD to coconut oil allows you to choose a low amount of CBD or higher amount, depending on the magnitude of effects that you want to feel. 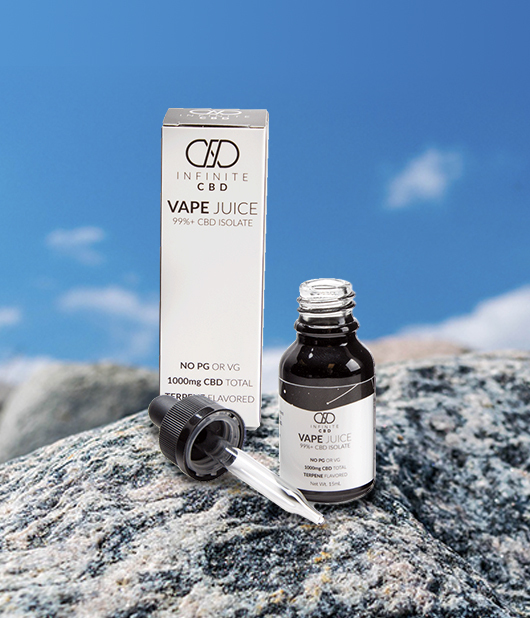 Infinite CBD Vape Juice | The vape juice is available in quantities of either 500mg or 1,000mg. There’s a wide selection of terpene ingredients to choose from, including; Harlequin, Jack Herer, OG Kush, and Jungle Cake. The vape juice is PG and VG free. Infinite CBD Capsules | There are isolate capsules, A.M capsules, and P.M capsules available. The isolate capsules are available in either 10, 25, or 100mg of CBD isolate, the A.M capsules are for sale in either 25 or 100mg of CBD and 100mg of caffeine (making them ideal for when you want to energize and revitalize), and the P.M capsules are to increase melatonin and help you to sleep well – containing 3mg of melatonin. Each of the capsules is available to purchase in quantities of either 30, 50 or 100. Infinite CBD Asteroid Gummies | These gummies are available in packs of 5, 10 or 20, and each gummie is packed with 25mg of CBD isolate. If 25mg of CBD is too much, you can try cutting the gummie into smaller pieces. Infinite CBD Topicals | Afterglow, Freezing Point Cream, and Freezing Point Salve are topicals that you can apply directly to the skin. These help with aches and pains, inflammation, and aid in promoting skin health to reduce healing time and for revitalizing the skin. Infinite CBD Beard Flux | The first time we’ve come across this type of product, we are rather impressed. This is perfect for a dry, itchy beard, as well as dandruff. It’s an oil that can be applied directly to the beard. Infinite CBD Dark Matter | An antiseptic CBD product, Dark Matter combines the antiseptic properties of soap with the incredible benefits of CBD. Perfect for when your skin is at its weakest, you can simply lather the affected area with Dark Matter to clean it up. It helps to prevent the spread of infection and bacteria. Infinite CBD Nano CBD Shots | The Nano CBD Detox Shots offer a serving of superfoods. There is a Detox, Energy, and Rest option available in the shots. These are great for detoxing the body from everyday environmental chemicals that we come into contact with. Infinite CBD Nano Water | Getting the great benefits of CBD is as easy as drinking your daily dose of water with Infinite CBD. Their water is naturally filtered by the springs in Colorado and infused with nanotechnology CBD. Infinite CBD Nano Non-dairy Creamer | You can stir this into your beverage of choice and experience your daily dose of CBD with a tasty twist. Infinite CBD also offers a Pet Droppers range for your furry friends, as well as a special collection of merchandise which includes four T-shirts. Isolate Droppers: Prices ranges from $12 to $128 depending on size and potency. The droppers are available in 250mg, 500mg, 1,000mg, 2,500mg, and 5,000mg. Vape Juice: The 500mg vape juice can be bought for $41, and the 1,000mg option will cost you $58. Capsules: The isolate capsules range in price from $20.64 – $370.08, the A.M capsules from $38.76 – $385.29, and the P.M capsules from £38.76 – $385.29. Topicals: The Afterglow product costs $18.10, the Freezing Point cream ranges from $14.00 to $35.99 depending on the size and strength, and the Freezing Point Salve has a stick option which is $28.20 or tin which is $49.08. Nano CBD Shots: The Nano-Rest and Nano-Energy is $4.50, and Nano-Detox is $5.50. Nano Non-dairy Creamer: The creamer price is set at $16.03. If you are seeking a superior CBD fix and a wide range of CBD products to fit your specific needs and preferences, and to help with general inflammation, any type of pain, anxiety, stress, and other health conditions, then Infinite CBD is a great company to look into. Their range of products on offer is truly outstanding – there really is something for everyone. Also, we forgot to mention during the Infinite CBD review that this would be a good company to look into if you’re wanting to get in on the CBD oil benefits but are worried about drug testing. Since most of their products are entirely THC-free, there is absolutely no reason why they should cause someone to test positive for a marijuana drug screening. While it is extremely rare to test positive after taking full-spectrum CBD products, it is possible. 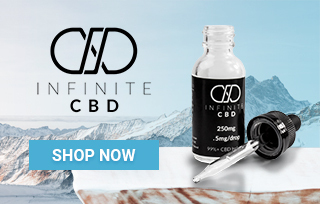 Anyway, we hope you found this Infinite CBD oil review to be helpful and informative, and be sure to check out their current offers and range of products online at the official Infinite CBD store. Thanks for reading! Infinite CBD Beard Flux works great in treating dry and itchy beards and the oil also helps to keep dandruff at bay. I recommend this product for everyone rocking a beard. This website is so fun! I love all the CBD isolate names, my favorite at the moment is Afterglow. It works wonders for dry skin. I could never go back to using CBD oil after these capsules, so convenient! I've always had to drag myself through the work day, and by the end of it I would be exhausted. But the CBD Oil from Infinite CBD has really helped with my energy levels - now i have time to enjoy other hobbies when i get home. The last thing I want is my dog to be anxious every time we have to take a car journey…that’s why I invested in the CBD Pet Dropper – super effective! Abigail from La Grange just bough! Hamza from La Grange just bough! Braden from La Grange just bough!